When you go in for an interview, employers are looking for some very specific qualities that can only come across in person when your resume is brought into context. Some of these qualities are not what every employer is looking for, but this should also serve as a red flag. For example, if you are not hired because you are an independent thinker with career goals, that’s not someone you wanted to work for in the first place. With that in mind, let’s take a look at what employers today want. Employers want to hire people who understand their goals in both their career path, and in life in general. Those who know what they want and are willing to put in the work and take the necessary steps to accomplish their goals work harder and come with fewer undesirable surprises once hired. Employers like to know what they’re getting themselves into with new hires as much as possible. This is much easier when employees know themselves and their goals. Work ethic comes along with having long-term goals and a plan to get there, and with knowing yourself and your abilities, as well as what you want to develop in yourself through this job. As stated before, if your employer doesn’t want this, you don’t want to work there! Employers that value independent thinking and problem-solving abilities run ventures that don’t want to stagnate. They want to improve – both for their customers and clients, in their service, and as a place to work. If you’ve got an idea and can communicate it, as well as how to implement it, the employer you want to work for wants to hear about it. In your interview, you will likely be asked to describe a situation where you faced a challenge at work, in school, or elsewhere in life. Be prepared with an instance that demonstrates the way your mind works and how you solve the problems that come your way. Have you seen a long-term project through to the end? Employers want to see that in their new hires. This shows that you can start something and stick with it through the challenges it entails and the new skills you have to learn to surmount them. Whether it’s running a marathon or completing a bachelor’s degree, being a long-term volunteer, or starting a business, employers want to know what you’ve done already to gauge what you can do for them. In the same way, they want to see that you’re not completely riding on one or two past accomplishments, but are continuing to learn and expand your skill set. They want to see that you are capable of learning new things, and beyond that WANT to. Every new job or new workplace has a learning curve, and employers need to know that you’re willing to engage it. While these skills are not necessarily learned, more and more jobs – even entry level positions – require a bachelor’s degree as a minimum requirement. Having earned a bachelor’s degree shows that you have already accomplished a long-term goal that included learning new skills, growing as a person, and making sacrifices and tough decision to move yourself along your path to your goal. The academic content of a US bachelor’s degree also teaches problem-solving and independent thinking skills that employers are looking for. While a bachelor’s degree still signifies all of these things and more to employers, the reality of post-secondary education in the United States is different. In fact, it takes most college students six years to complete a four-year bachelor’s degree in the United States, and more and more students are taking many years off or dropping out entirely because of work, health, and family obligations, as well as financial considerations. If you have completed some college but never earned a degree, this can look even worse on your resume than never having enrolled in the first place. 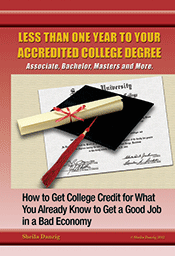 However, you may have already earned the equivalency of a US bachelor’s degree through the college credits you have completed and through work experience. Visit us at thecareerpeople.com to learn more.